This Stemless Wine Tumbler has a double-walled exterior with a vacuum between the walls. This means your drink has no medium for the heat or cold to transfer through. Your drink will truly stay as hot or cold as possible. Even filled with ice or boiling water, the bottle will never sweat or get hot to the touch! The Simple Modern insulated tumblers are made of high-quality food grade 18/8 stainless steel. Whether you are drinking water, beer or even coffee, this tumbler will not retain the taste or smell of any liquid. 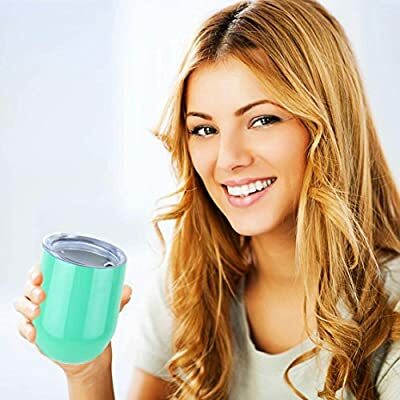 This travel Wine Tumbler will keep your beverage the same temperature as long as possible and the clear lid makes it easy to drink out of on the go. This is perfect for the office, road trips, sporting events, use at home and so much more. Take us with you as you make a positive impact and show the world who you are!
? Stemless Wine Tumbler with Vacuum Insulation Technology: This Stemless Wine Tumbler has a double-walled exterior with a vacuum between the walls. This means your drink has no medium for the heat or cold to transfer through. Your drink will truly stay as hot or cold as possible. Even filled with ice or boiling water, the bottle will never sweat or get hot to the touch! ? Stemless Wine Tumbler with Premium Stainless Steel: The Simple Modern insulated tumblers are made of high-quality food grade 18/8 stainless steel. Whether you are drinking water, beer or even coffee, this tumbler will not retain the taste or smell of any liquid. ? Stemless Wine Tumbler with Drinking Lid is Included: A sleek and durable lid is included for easy drinking and to keep your drink insulated. A straw fits through the opening in the lid, the lid does not close completely. ? Stemless Wine Tumbler with Durable Powder Coating: Enjoy the protection and color that rugged powder coating adds to the tumbler. The powder coating is sleek and durable, making it the perfect travel companion. ? Take the Stemless Wine Tumbler With You: This travel Wine Tumbler will keep your beverage the same temperature as long as possible and the clear lid makes it easy to drink out of on the go. This is perfect for the office, road trips, sporting events, use at home and so much more. Take us with you as you make a positive impact and show the world who you are!